Stephanskirchen – "The willingness to donate shows no sign of ceasing" according to local media sources. Hamberger Flooring has also done its part in helping to get the flood victims back on their feet. 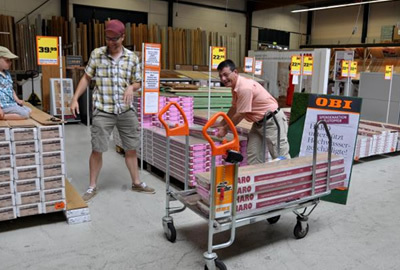 The company donated 3,000 square metres of parquet and laminate flooring valued at some 50,000 euros to the flood victims in the town and district of Rosenheim. Around 100 affected families received assistance quickly and with a minimum of fuss thanks to the direct distribution on the ground. The 3,000 square meters of flooring were distributed fully within three days. This clearly shows how many people in the district suffered massive damage to belongings and how delighted they were to receive help. Hamberger has moreover started a campaign together with local trade partners in the flood regions in Germany and Austria to also help improve the situation of those affected in these areas.